CAIRO — Sudan's embattled president flew Tuesday to Qatar, the tiny but wealthy Gulf state that has offered him help as he faces protests initially sparked by the country's economic woes but which soon shifted to calling on him to step down. Qatar's official news agency said President Omar al-Bashir, in power since 1989, will meet Wednesday with the emirate's ruler, Sheikh Tamim bin Hamad Al Thani, to discuss "brotherly relations and ways to bolster them." Sudan's official news agency reported his departure from the capital Khartoum, saying he and Sheikh Tamim will discuss bilateral relations and efforts to cement peace in Darfur, the western Sudanese region where security forces brutally crushed a rebellion. Al-Bashir was indicted in 2010 by the International Criminal Court for genocide in Darfur, where an insurgency erupted in 2003. To avoid arrest and repatriation to The Hague, the court's seat, he has restricted his travel to African and Arab nations. The dispatches by the two agencies gave no other details on the Sudanese leader's visit, but in a Dec. 22 telephone call to al-Bashir, Qatar's ruler stated his country's readiness to "provide all that is needed" to help Sudan get through its crisis, according to a report by the official Sudanese news agency. There has been no word since on whether the emir made good on his pledge, but the Sudanese leader's visit is widely interpreted as a bid to secure urgent financial aid to Sudan, which lost three quarters of its oil wealth when the south of the country seceded in 2011, plunging the country into its worst economic crisis in decades. Significantly, al-Bashir's key Gulf allies Saudi Arabia and the United Arab Emirates have made no official pronouncements explicitly supporting him. 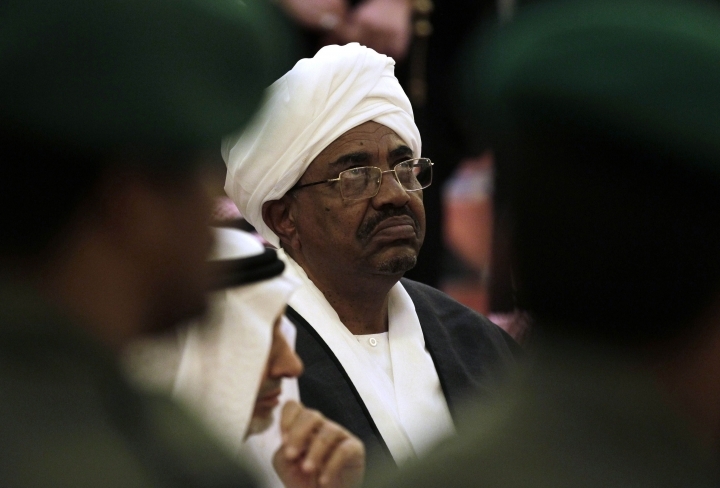 Egypt, Sudan's powerful neighbor to the north, has publicly announced its support for stability and security in Sudan but, again, made no mention of al-Bashir. More recently, he has blamed the unrest, now in its fifth week, on saboteurs and what he repeatedly calls foreign schemes against Sudan. Already among the longest serving leaders in the region, he has said any change of leadership could only come through the ballot box, a reference to next year's presidential elections in which he is expected to run for another term in office. Al-Bashir's security chief, Salah Qoush, has given rare insight into the government's views on the unrest in a leaked audiotape purporting to contain remarks he made at a closed meeting Sunday. The authenticity of the tape could not be independently verified, but Sudanese activists said the voice matched Qoush's. He blamed the unrest on secularists and communists and vowed that Islamic rule in Sudan would "never ever" be brought down by demonstrations. "We must revise (our policies) and improve our performance, but we must also defend our (Islamic) experiment," said Qoush, himself an Islamist. "The government will not fall, not even after six months of protests," he added.